Monica G. Tibbits-Nutt, AICP, LEED AP BD+C is the Executive Director of the 128 Business Council. Working in regional planning and transportation, Monica’s areas of specialty are transportation planning, urban design, and sustainability. Her work experience includes public sector transit planning at both the MBTA Advisory Board and as Executive Director of TransitWorks. 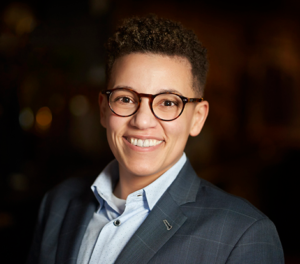 In addition, Monica has worked in regional planning and development for the Mid-Ohio Regional Planning Commission (MORPC), the City of Columbus Planning and Development office, and the Greater Linden Development Corporation. She received a Masters of City and Regional Planning from the Ohio State University in Columbus and a Bachelor of Science in Political Science and Sociology from the University of Southern Indiana. In both her work and research, Monica is interested in developing regional strategies that not only integrate sustainable practices into transportation, but also capitalize upon every opportunity to better educate the public about all aspects of the planning process. She serves as the Vice President of the non-profit Youth Engagement Planning (YEP! ), which brings urban planning and community advocacy into K-12 environments. More generally, Monica is an active member of the research community. Select links to her writing and film work, as well as information about past featured speaking engagements, can be found in the Press section. Monica serves on the Massachusetts Department of Transportation (MassDOT) Board of Directors and the Fiscal Management and Control Board that currently oversees the MBTA. She is a gubernatorial appointee to the Board of the Metropolitan Area Planning Council (MAPC) serving on the Executive Committee and Legislative Committee. She has formerly served as Vice-Chair of the Regional Transportation Advisory Council (RTAC). She is an active member of the American Institute of Certified Planners and a LEED Accredited Professional in Building Design & Construction with the U.S. Green Building Council.